If it would let me make a thread title with a word in all caps, we could just call it NASCAR 2013. Of course, if we wanted to be accurate, I'd just call it "Whining." I decided it was time for a fresh start from the last thread, which was really just a lot of essays about why I hate American racing but can't look away from it. No point in that. I'm hearing a lot of positive things about NASCAR's 2013 car, called the Gen-6 (RIP COT). The body panels are now fiberglass and carbon fiber, which is a big change for the teams, and the cars more strongly resemble production counterparts. Of course, the Chevrolet and Toyota still have grille and headlight stickers, while the Ford is running a real grille (but headlight stickers, still. So they're not all grown up just yet. Anyway, Dale Earnhardt, Jr. has said some promising things about how the car drives much closer to the way the cars drove about a decade ago, and I think that could bode well for the racing. Goodyear's going to play around with different tires, too, which would go a long way in improving the product. In Nationwide, you have shorter fields next year (40 cars) to eliminate start-and-park a bit and a new race at Mid-Ohio Sports Car Course, which I think will be a blast. The Truck Series has an exciting schedule of its own, a manageable 22 races including a road course (Mosport...and a glorious one it is) and a dirt oval (Eldora). Wild. I'm kind of looking forward to next year's season, for once. That's the Ford Fusion. You'll recall Brad Keselowski won the title in a Dodge last year. The cars even have a place for license plates at the back now. You'll also notice that driver names will now be on the windshield, which makes me wonder why we need to have big goofy numbers anymore. The cars would like so sharp with sponsors on the doors, in my opinion. You can see all of the revealed 2013 liveries here, though not all are on real cars (some are just renders...and poor ones, at that). Kyle Busch's 2013 car. I really hope he has some reliability next year. Like him or not, the races are a lot more fun when he's in the mix. It still feels wrong to be excited about NASCAR for next year. They do look good, them 2013 cars. If only they made the back of the cars resemble the road versions, but one step at a time. I watched the occasional NASCAR race this year, and mostly always enjoyed it. It is a...very different culture (putting it diplomatically!) to most the stuff I get to see over here in Europe, but I like to see new things. I'd even started to support one driver in particular by the end of the year. Will definitely watch the Daytona 500 and then go from there. These new cars do look interesting, and maybe they will improve the racing. Hopefully the changes are much more than just skin deep. NASCAR's a lot of fun. I just get butthurt about it because I take it too seriously. It's hard to say what impact the new cars have, because the chassis aren't changed significantly. The drivers seem to suggest that they drive very differently, though, which is a good start (the biggest change is that they've gotten ridden of the "rear steer" in the cars; if you've ever seen the cars going down the straightaway at a place like Indianapolis, they look like they're skewed left...that's rear steer in action. They align the car in a way that rear wheels actually help to turn it left. That's been banned so the cars go straight into the turns, which makes turning more of an art again). I do think you'll see the differences at Daytona and Talladega. The tandem drafting is very hard to do now because the front of the cars have a shape to them, so they don't line up with the rear as well. It's still faster to tandem draft, but the risk of spinning is much higher. That either means drivers will be smarter and we'll see a cleaner race, or it means they run it all behind the safety car. But I do like seeing cars in the Florida sun in the middle of winter. Makes me feel better. The new cars will be testing at Daytona from January 11-12, with live TV coverage in the U.S., so hopefully some video of them in action makes its way onto YouTube after, since I'll be watching Dubai those days. For some strange reason, I found myself supporting Clint Bowyer. I've no idea why really, maybe I just liked his livery or something? Because that's what you do when you're new to a different form of racing, isn't it? "Hey, that guy's got a cool livery. I'll support him." I also found his reaction at Texas (or wherever it was) after he'd got taken out by Jeff Gordon to be quite funny. You don't see mass brawls between drivers and teams in Formula One, that's for sure! Anyway, to tie it all together, Bowyer's going to run the Rolex 24 in the AF-Waltrip Ferrari F458, so that's something you can look out for. It'll be interesting to see his lap times. Can't really go wrong supporting a professional driver who has raced F458s, right? One guy you won't see in NASCAR in 2013? Robby Gordon. He hasn't done much lately driving for his own team, but you can always see Robby working on his own cars (in anger ) and that's cool. Robby is a multi-time champion in off-road trucks. He's a class winner at Daytona and Sebring (four and three wins respectively in IMSA GTO/GTS-1), a stage winner at Dakar, a winner on ovals and road courses in NASCAR, a winner on ovals and street courses in IndyCar (CART), and a winner in Trans-Am. He also did well in IROC and representing the U.S. in the Race of Champions back when it had the off-road component to it. Jack of all trades, master of one. Thanks, I didn't know that. That is something to look out for. Oh well, he can't be much worse than Brian Vickers and Waltrip have been, surely? Vickers actually wasn't too bad in Bahrain. You consider that Rui Águas is one of the weaker "pro" drivers in GTE-Am (I may be wrong, but I actually think Águas is rated as Silver, which means he's classified as an amateur, though he was moved up to Gold after last year, but appealed, and is now Silver again...), and Rob Kauffman is arguably the weakest gentleman driver in the class (or in the world), so for that team to finish second in class, Vickers couldn't have lost them too much time. Interesting to see that two of the three Joe Gibbs drivers on the list (Labonte and Stewart) won titles the following year, while three of the four Roush drivers (Edwards, Biffle, and 2002's Martin) failed to finish in the top ten the subsequent season in four instances (with Edwards having now done it twice for the team). Is Chris James the worst racing driver on all of social media? Erm...what?! Has he got computer diarrhea? Or is he high or drunk or something? Literally no idea what any of that means. NASCAR is working on new technology (technology, what's that?) that will debut sometime this season for the purpose of track drying. It should speed that process up 60-80%, which would be nice. Lengthy rain delays aren't much fun for anyone; TV viewers leave, TV networks shift the coverage to other stations, people at the track go home...and if the race gets moved to Monday, well, a lot of people who paid can no longer go, and a lot of people who would watch no longer can. Of course, my solution to track drying for road courses is to just use rain tires, as that would really speed it up, but in Sprint Cup, they'll just never do that. Daytona testing started today. I may watch some in the afternoon to see the 2013 cars on-track for the first time. The morning sessions will be streamed here: http://stream.speedtv.com/daytona (9:00 AM GMT -5 every day through Sunday I think). That guy I quoted, Kenny Wallace, is doing the commentary on the feed, too. Watched quite a bit of Daytona testing. I was curious to see what the cars looked like on track and how they ran in packs. It was quite interesting. I'm actually quite excited for NASCAR this year. I don't know whether it is because of the new cars, or because I now have a guy to support, or whether I enjoyed it last year and want to see more...I don't know. I know I won't be able to see every race what with the time difference, particularly for night races, but I'll try and watch as much as I can this year. I too would like them to use wet tyres on road courses...I think that would help improve the image of the series a lot abroad. I think one of the issues that people have in the UK is that with a lot of the racing that happens in this country generally happening when it is raining ( ) they can't understand why another type of motorsport doesn't. I know it is quite a generic comparison to make...but seriously, wet racing should be something you look forward to. I like wet races, they add more excitement...and with those types of cars in the wet on a track like Watkins Glen, I guess you wouldn't have to wait long for the action to start! Anyway, as I say, looking forward to Daytona. Hopefully the Toyotas will be strong. New cars are responsible for my interest, so we'll see what happens. NASCAR says they won't make changes to the cars, which is nice. The drivers are going to need to be patient, I think, because there's no margin anymore. The bumpers don't line up, and the cars spin easier, so if you time a little nudge wrong, you cause a big wreck. I think that the smaller spoilers will help with the racing on normal tracks even more than at Daytona and Talladega, which are weird exceptions to everything. Plus, the cars just look better with the shortened rear ends and unique bodywork. Thought this was an interesting shot to highlight both the spoiler size and the lines on the Toyota (my favorite of the cars). Kenseth, for the record, is my early pick for the championship, even though he's new to the JGR team. On another note, Harry Vaulkhard is testing with MacDonald Motorsports, a back-marking Nationwide Series team. He had intended to do the Racecar Euro Series last year, and wanted to switch to NASCAR for the last few years. The King is left without a Cassill. Landon leaves BK Racing. David Reutimann will replace him. (He later posted a picture of his championship ring on Twitter; he was a Hendrick test driver when Jimmie Johnson won one of his titles, so he has a ring from that. I get what he's saying; it just sounds weird). Tommy Baldwin Racing assumes the #7; Robby Gordon won't be racing in 2013. That's one of Tom Baldwin's modified racecars (team owner Tommy is his son). Tom died in a crash at Thompson Speedway in 2004. I have a 1:64 model of the last car on that page. We used to go to a handful of modified races each year. Thompson's one of my two local tracks. Glad they got the number. Dave Blaney is the driver of the car, by the way. For a moment, we all thought he had the Daytona 500 won last year, too, while the track burned down. I still wonder if that race really happened...it was 2 AM, I had been in classes all day, and here I am, watching Dave Blaney in the lead of a red-flagged race while a jet dryer exploded and the track was on fire...surreal. I suspect this year's 500 will look a little different, don't you? The name Gen-6. 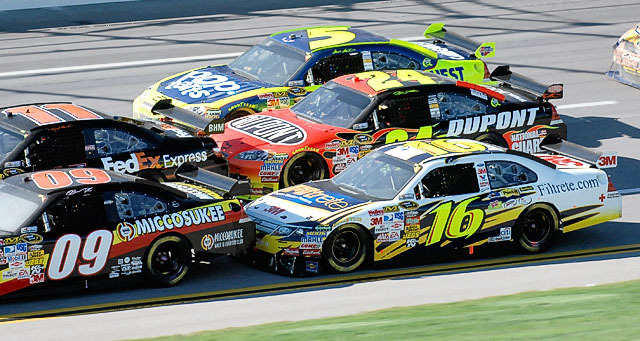 NASCAR has defined this as a the sixth generation car. I disagree. So that makes this Gen-12. To me, at least. NASCAR will consider running exhibition races in Europe to coincide with the Racecar Euro Series (oddly enough, these cars may be faster on a road course, given they are over 1,000 lbs lighter and have wider tires). Obviously, it would not be part of any championship, and no points would be awarded, since many teams probably couldn't afford it. They haven't said which tracks, but I would guess they will not run the Lausitz, Rockingham, or Mallory Park ovals as there are no SAFER barriers. I assume it'd be a road course. Seems weird to go to Europe. It's not that there aren't racing fans there, but there's just no money, and a 7 AM race on the U.S. east coast isn't exactly going to generate a ton of TV revenue. I guess we'll see how close to reality this gets. NASCAR raced at Suzuka and Motegi from 1996 to 1998 in an exhibition. They also did an exhibition or two at Calder Park's oval in Australia. Check out Casey Mears in third. They're a very a small team; I was surprised they had the budget to even test at all. We've seen Chevrolet, Ford, and Toyota all look fast in various tests on different tracks, so it seems like allowing the manufacturers some aerodynamic freedom has actually improved the competition. Some are saying the cars will develop so quickly that the ones they are testing today will be obsolete by March...expensive, but I don't mind that at all. I want to see the automakers get back into it. More and more cars testing in full livery. Most of the 2013 paint schemes we've seen are here, for reference, with a few exceptions (like the Mears GEICO car in the gallery above). I think the FedEx cars are the best so far. I love the FedEx Office one in particular. That's very interesting. Thanks for posting that information. If NASCAR did come to Europe, and if they did come to race in the UK, I'd definitely consider attending. But it is hard to see what track they would use if they didn't use an oval. 1. If it does become a reality, they should definitely consider running on rain tyres. If it is a non-championship scoring event, what does it matter? Plus I think they have to consider that there would be a more than decent chance that it would be raining. I can't see fans over here being that impressed if they turn up and find the race is delayed/cancelled due to the wet weather, particularly when most people will go to a BTCC event even if it is chucking it down with rain. 2. When would they fit it in the calendar? From memory, there's only really a couple of weekends when they don't race during the year, and those tend to be holidays for you guys. So I'm not entirely sure unless they put it right at the end of the year where they would fit it in. But it would be interesting to see what happens. I do think that if it did happen, there would be a good crowd if it was promoted right. NASCAR has a decent following in the UK and further into Europe as well with most people at least knowing what it is, thanks partly due to a couple of features on Top Gear etc. I think several people, including myself, would turn up just out of curiosity to see what it was all about. May never happen, and they've probably talked about this before, but I personally hope it does. What? You don't think a race in England in December would work? The Pennzoil car's awesome, even if the driver isn't. ...but it's no good if you don't have a camera. Jamie McMurray has a new sponsor and the car looks awesome. Bruton Smith wants start-and-park eliminated and speeds reduced. The first part? Great, excellent. If you think about it, the TV contracts require 43 cars to start every race. The purse money paid to those cars comes from the revenue NASCAR gets from those TV contracts. Basically, FOX, TNT, and ESPN are paying the start-and-park teams to be there. I'm not sure that was the intention. Reducing speeds? No, but thanks for offering. The speed is the appeal of auto racing, whether it is on ovals, road/street courses, drag strips, or whatever other alternate routes you can take (rally etc). I sometimes wonder if all these camera angles and slow motion replays that make the cars look slower have hurt auto racing more than they have enhanced the coverage. On a personal level, I can't really get into things like the BTCC or WTCC because the cars are slow. I know that sounds elitist and stupid, but it just doesn't excite me to the same degree F1 and sports cars can on road courses because you lose the striking visual of cars going waaaaay too fast to be possibly corner and yet somehow they do. The manufacturers want more road courses. Road America and Road Atlanta may be coming in 2014, at the expense of two oval races. On paper, excellent. In reality, NASCAR needs to start using local yellows. I know they know they exist; they have used them in the past. They just choose the full course yellow to bunch things up for "excitement." Moreover, I have no idea how NASCAR enforces local yellows without telemetry. Still, it needs to happen. A 4.0-mile track like Road America can provide a ton of excitement, but it can also be a real task to watch when even a short caution takes 20 minutes. By the time you get that thrilling restart, viewers have already left because they just can't sit around watching nothing for so long. I will definitely welcome the two RAs if we can all agree that not everything has to be an FCY. Also, I am curious as to which tracks would lose races. I doubt they will touch the 1.5-mile ovals, which are the ones that really need to go. I know people hate Michigan, Pocono, Fontana, etc., but to me, those tracks actually have some good racing and unique attributes. Imagine that, though, me having a minority opinion about racing. Reducing speeds? What...why would you even consider that? I know that we've had this particular conversation before, but it pains me to see cars like Formula One cars get increasingly heavier, slower, having less power...it just makes me think that if we're not careful in ten years time we're going to end up with Formula Renault like cars in F1. I'd rather not see that start to happen in other forms of racing either, thanks. I don't wish to sound flippant about safety as it is still incredibly important, and any safety improvements that can be made should be, but slowing cars down is definitely not the answer. Not saying the two are linked in this particular case, but that is almost how it comes across in a lot of forms of racing these days. It's almost like the people involved at the very top in racing still feel uncomfortable with their sport having a reputation of being dangerous, even when fatalities and serious injuries have decreased significantly over the past twenty or thirty year. The three most important areas of racing to keep me interested at that cars are interesting to look at and are innovative, that they continue to sound brilliant, and that they don't continue to get any slower than some of them already are. After all, if cars aren't challenging to drive and fast, then really the sport doesn't have anything going for it at all, because then anyone could make the argument that they were talented enough to be a race driver if they had enough money. Sorry for derailing the topic somewhat with that rant. But had to be said. I approve of the idea of more road courses. I'm a fan of both those tracks, but yeah, as you said, they won't be that much fun if they have a full course caution every time there is an incident. Long cautions are no fun. It is something that F1 has been struggling with again actually. I like the idea of getting the lapped cars out the way for the restart, but it seems to take an absolute age to do so, meaning more laps than should really be necessary behind safety car. But back to NASCAR - my ideal situation (even though this probably won't ever happen) would be to have a 50/50 split during the year between ovals and road courses. The other thing I'd quite like is a road course during the chase, or even as the season closer. I could imagine that would be a great way to round out the season in style. Smith wants reduced speeds because he thinks it will make for better racing. It had nothing to do with safety. It is still, in my mind, a dumb suggestion. Luckily, Smith has so little influence with his silly ideas. As for the Chase, it's believed that the Road Atlanta round would be part of it. I'm all for throwing more variables into the Chase. The ten races leading up to the Chase have a ton more variety than the Chase itself does.